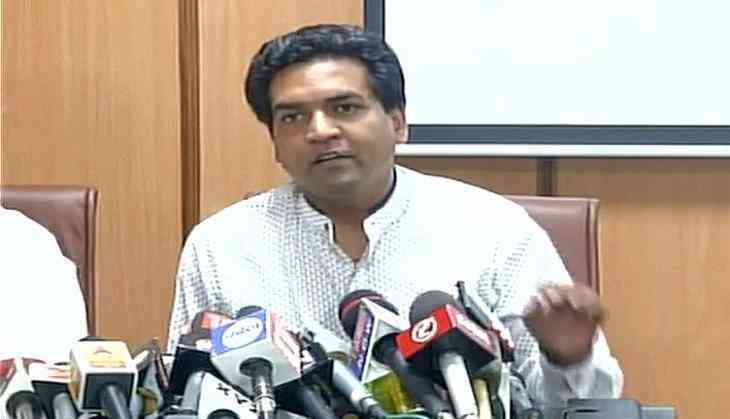 Sacked Aam Aadmi Party (AAP) minister Kapil Mishra, whose vociferous campaign against the Delhi Chief Minister continues in full steam, entered its third round today as he leveled a new set of charges against Arvind Kejriwal. Mishra dropped another bombshell on friend-turned-foe Kejriwal claiming that the party received money through 'hawala network'. Mishra showed a powerpoint presentation in a press conference as 'evidence' to back his claim that the party received funds from shell companies. "Arvind Kejriwal is keeping quiet despite me providing clinching evidence of his corrupt practices. I have also presented evidence on the Hawala case last Sunday. It been one week, but no one from the AAP has come up with any clarification. It is evident from this presentation how AAP forged letter heads to shell companies. Even the letter heads were fake," he said. Mishra also challenged Kejriwal to inform the Income Tax Department that the donation amount received by AAP was from Mukesh Kumar. "I will prove two things. Aam Aadmi Party gets fund from Hawala operators...They are avoiding my questions. The video which was tweeted by Kejriwal on Twitter on Thursday was fake. The Letterhead of companies, who gave donation to Aam Aadmi Party are forged. I challenge Arvind Kejriwal to tell Income Tax Department that the donation was received from Mukesh Kumar. Mukesh Kumar's company is a bank defaulter. How can he donate Rs 2 crore to Aam Aadmi Party?" he added. Rubbishing the claims made by Mukesh Kumar of having donated Rs. 2 crore to AAP, Mishra said it was all plotted by Kejriwal to conceal the identity of Hem Prakash Sharma, who is director in several companies. "Mukesh Kumar's company is also VAT defaulter. Instead of paying VAT to Delhi government, the company donated money to party. Delhi government had issued notice to SKN associates, which later donated money to Aam Aadmi Party," he added. "Why doesn't the Chief Minister give an answer? Kejriwal will have to leave the country the day party leaders' foreign trips come to light," he continued in a strained vein. Meanwhile, Delhi Health Minister Satyendar Jain has filed a defamation case against Mishra and MLA Manjinder Sirsa. Mishra accused Kejriwal of corruption, claiming that he witnessed Jain handing over Rs 2 crore to the Chief Minister. On Thursday, an east Delhi resident had claimed that he owned the four companies that had donated Rs 50 lakh each to the party in April 2014.